Walk into the two largest ethnic neighborhoods of Downtown and learn about their growth and history in Los Angeles. Understand how international issues, such as nationalism, World War II and segregation affected the Chinese and Japanese cultures, but have allowed each to retain their strong community neighborhoods. 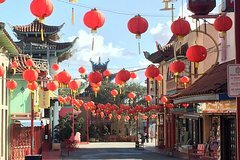 Discover and walk the two largest ethnic neighborhoods of Los Angeles, Little Tokyo and Chinatown! This two hour tour will take you into the center of both respective cultural neighborhoods. You'll learn about how the Japanese and Chinese populations were brought to Los Angeles to provide labor and eventually found their own identities through struggles of nationalism and World War II. To this day, Los Angeles has a rapidly growing Chinatown and the largest Japanese neighborhood in North America!